We started things off with Isle of Skye. I first played this Kennerspiel des Jahres winner for 2016 at Gen Con and found it great then. Replaying it at DGM reminded me that I need to play it more often. It is a mix of Carcassonne‘s tile laying and Castles of Mad King Ludwig‘s auction/price-setting mechanics. 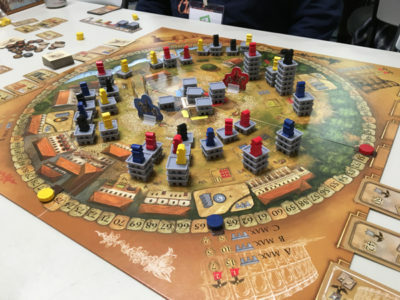 My friends brought Fantasy Flight’s new Doom board game but I had my eye on the Pegasus Spiele game, Porta Nigra. 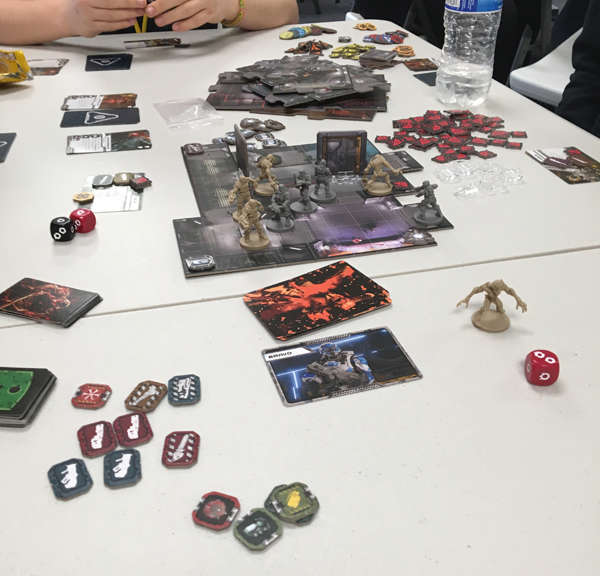 I’ve been trying to get a demo or play-through of this game for awhile now but it hasn’t been at Gen Con so I dove into the rulebook while the others figured out Doom. 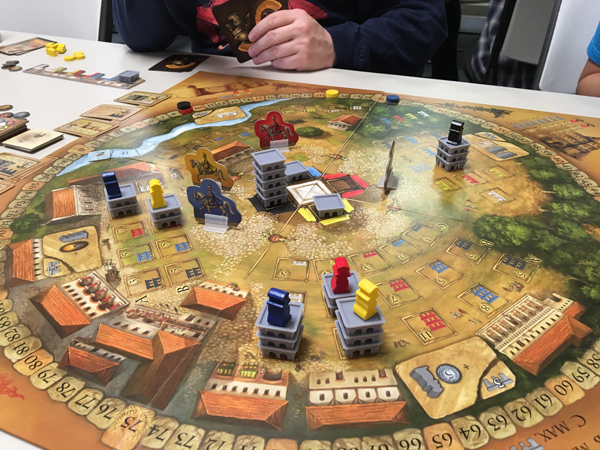 By the time their Doom “learn to play” scenario was done, I had Porta Nigra read and set up. 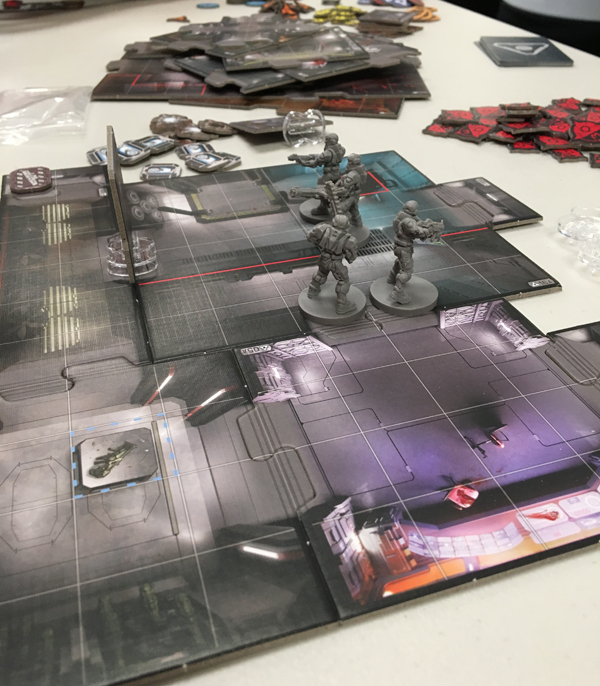 The game went well and has an interesting area control system to it. Ultimately, I failed to realize the importance of the side set collection mechanic and performed pretty poorly. I’d like to try it again but I don’t see a need for it in my collection though I find the tower building aspect pretty charming. We started looking through the DGM library some more and saw AssassinCon by Mayday Games. The idea seemed interesting as a board game version of the famous college game Assassin. Unfortunately, the game is pretty weak. The rules are horrible, the execution overly convoluted, and the game tends to reset itself just when things start to get interesting. Next we hit another game that I couldn’t ever find a demo for: Fleet Commander. This game seems to struggle getting across the pond as I’ve never seen it in stores or at conventions. 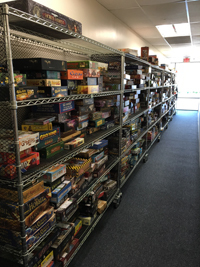 It must have some kind of following as it has multiple expansions. 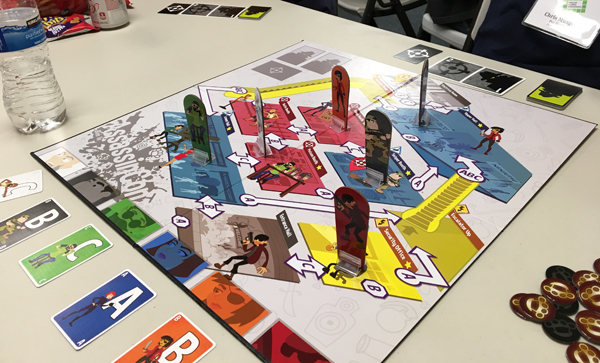 I think the game has some potential but the little intro game we played seemed to lack enough weight behind it to really feel competitive. It has an interesting dice mechanic where you pick from several colors to move ships, attack other ships, and put up defenses. Unfortunately, I have a plethora of two-player games and I’m heavily invested in Star Wars Armada so I’d play this game again but wouldn’t own it. 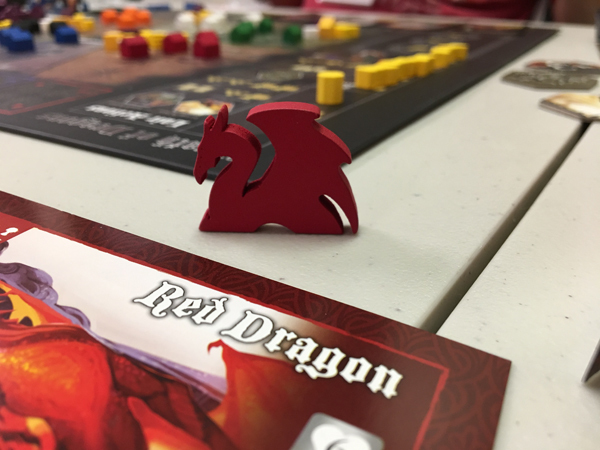 We ended the game picking up Catalyst Games Lab’s Wrath of Dragons. 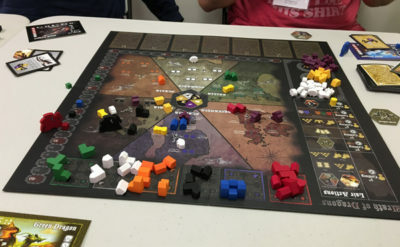 Wrath saw a lot of press at Gen Con a few years back and seemed to sell out at the Con due to it’s euro/worker-placement rules and destruction/fantasy dragons theme. tight game with a 10 point spread between top and bottom player. I actually found this game to be my favorite of the games I played at DGM (not at all influenced by the fact that I won. not at all). The combination of the Dragon theme, the worker placement and set collection made for a lot of things to do in the game and they were all interesting. Overall a very fun game that I’m considering picking up to add to my library and a great way to end our DGM day. Later, back at my friends house, we broke out the racing dexterity game RoadZters. This game is in direct competition to PitchCar and since it is no longer in print, it looks like it didn’t fare too well. 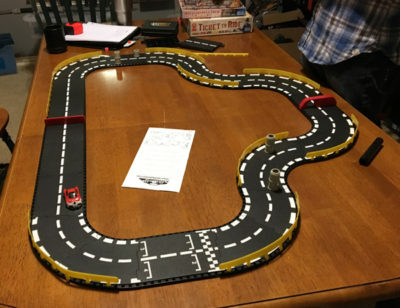 It has plastic race sections that snap in similar to electronic slot cars. The main mechanism centers around a special ball (Z-ball) with bearings (or magic?) inside that allow the ball to stop on slight elevation grades and spin in interesting ways. Overall, it plays exactly like PitchCar but you can do a lot more with the Z-ball in your flicking and it’s easier to have a smooth play track. 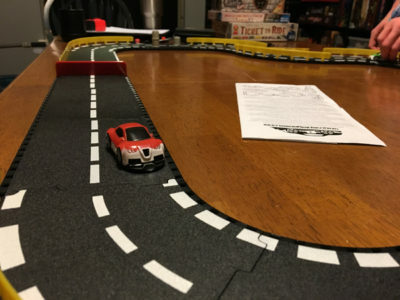 I already own and like PitchCar so I wouldn’t pick it up but found the game a fun alternative. 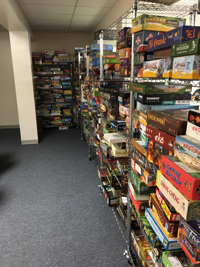 So that concluded an eventful Day 1 of “Fate Con.” Next time I’ll wrap up the last two days of the event with all the games we played at my host’s house. Sounds like some fun gaming. 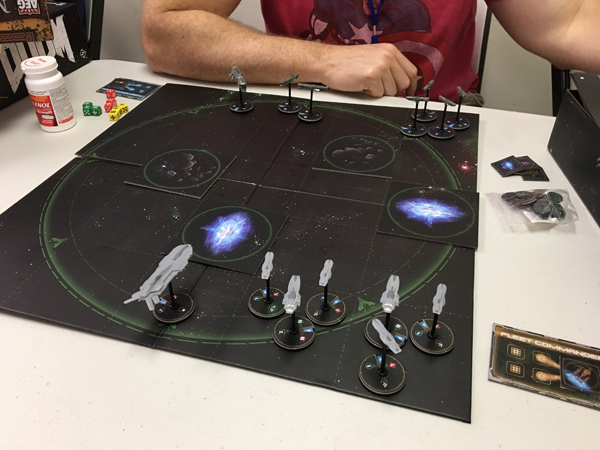 Fleet Commander was recently revamped in a Kickstarter. I backed it and am hoping it won’t be too long from delivery (probably another few months though). 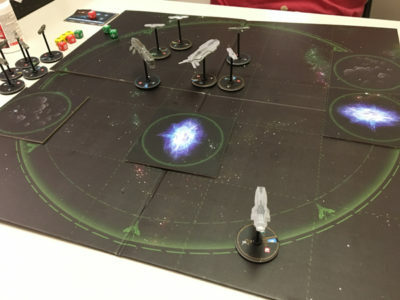 I thought the game play looked interesting and it ended up including quite a few pre-painted ships so I figured it would be worth the cost just for the ships. I’m hoping the revamp improved the game play a bit from what you experienced. Nice! A friend also backed the revamp so I’m looking forward to seeing it in action. I don’t think the original that we played was bad per se, but it was a bit simple. Granted, it’s hard to also fully judge something with one play but with so many games out there, it’s hard to dedicate more time to something to find out if you really like it.